This is the last Tuesday evening in the weekly Writing & Poetry Series dedicated to literary arts for the 2018/19 Season, with featured writers and open floor readings. All writers, poets, essayists, storytellers, and lyricists are welcome to read or to perform new songs, with the community welcome to relax and to enjoy the evening. 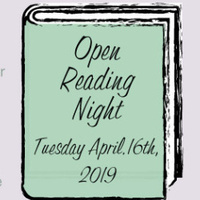 Featured writers include Richard Skidmore and Holly Pretsky who will read Story Day, a humorous short story about a somewhat desperate librarian.